The Goodbyes by Leslie Welch is now available! 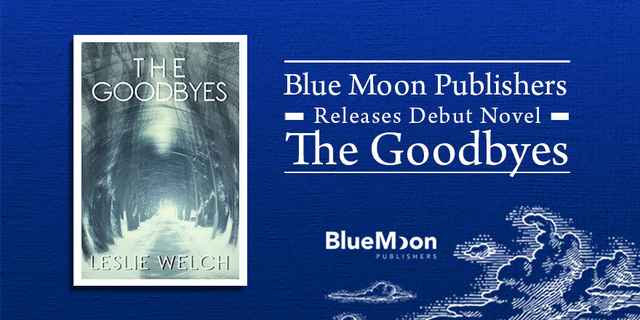 Debut author Leslie Welch is as excited as we are to be releasing her debut novel, entitled The Goodbyes, a moving and realistic account of the strength of an unbreakable bond, the anguish of unrequited feelings, and the wisdom attained through the highs and lows of triumph and tragedy. We are sending warmest congratulations from the Blue Moon Publishers team! Webb Turner grew up in a seemingly idyllic Pennsylvanian town, tortured by a troubled household. His young life is turned upside down by the exciting, magnetic, and wild girl next door, Bree. They keep each other at arm’s length their whole lives, however, dancing around the issue of their unresolved feelings while Bree’s life steadily spirals out of control. In the meantime, Webb’s life is on a different trajectory. He escapes the small town to become a globetrotting rock music sensation, with a new romantic interest on his mind and the past left in the rear-view mirror—until he hears that Bree is dying. This shocking news unleashes a torrent of unresolved angst that won’t be dammed until Webb drops everything and everybody mid-tour to undertake a dangerous drive through a blizzard to be by Bree’s side, just for one last chance to say his final farewell. The Goodbyes is being published by Blue Moon Publishers and is being marketed by DigiWriting, both firms based in Toronto, Canada. It is available on Amazon and at local bookstores. Born in Toledo, Ohio and raised in the North Hills of Pittsburgh, Leslie Welch spent most of her youth concocting elaborate stories. Her high school English teacher encouraged her to turn these creative lies into creative fiction. By some miracle, her writing skills persuaded Penn State University to accept her. Between her bartending shifts, she studied Fiction Writing and Communications. When she’s not off exploring the world (or getting caught in irons on Roanoke Sound), Leslie lives in a house full of laughter outside of Washington, D.C. with her soul mate, two cats, two dogs, two fish, and a teenager.